On April 3 in Cannes, at the International MIPDrama Screenings, the audience will have a chance to see Alexei Uchitel's “Mathilde,” a film about the love story between Tsar Nicholas II and famous ballerina Mathilde Kschessinska. RBTH remembers her and other famous mistresses of the Russian tsars. It was the tsarevich's father, Emperor Alexander III, who became the inadvertent initiator of the affair by sitting the pretty graduate of the choreographic school next to his son at a gala dinner. The 22-year-old Nicholas, who had not been seen having any romances before, immediately became involved with Mathilde. "Mathilde Kschessinska engages me in a positive light," he wrote in his diary. The 18-year-old ballerina requited his sentiments: "I fell in love with the heir on our first encounter… The feeling completely filled my soul, I could only think of him," she said. Nicholas bought Kschessinska a manor house in St. Petersburg where they could meet without complications. Their affair lasted for four years, until Nicholas married in 1894. After separating their destinies branched out in different directions: Turmoil and execution awaited the last tsar while Mathilde became a brilliant ballerina and a socialite, having affaires de coeur simultaneously with two Grand Dukes and emigrating to Paris, where she died in 1971, nine months before her 100th birthday. Catherine II's son Paul I was a Grand Master of the Maltese Order and considered himself a real knight, and every knight needs a ladylove. For this role in 1798 the emperor chose 20-year-old Anna Lopukhina. A contemporary of hers described her thus: "Lopukhina had a pretty little head, but she was of short height and ugly build, with a sunken chest and without any grace in her manners." Paul deified her. He called her in honor of ships and made his guard officers wear raspberry-colored uniforms, since that was Lopukhina's favorite color. Lopukhina loved the waltz and Paul canceled the ban on the dance that existed at the court. He even ordered his palace, the Mikhailovsky Castle, to be painted in a pale-brick color to match her ball gloves. And when Lopukhina told him that she was in love with another man, Paul maintained his knightly attitude: He arranged the marriage between Anna and her lover, Prince Gagarin. Until Paul was killed by conspirators in March 1801 Lopukhina had her own apartments in the Mikhailovsky Castle that were connected to the imperial chambers by a secret staircase. The heart of Alexander I, who ruled Russia for the first quarter of the 19th century, belonged to Maria Naryshkina, a scion of a noble Polish family. "Her beauty was so perfect that it seemed impossible," wrote famous memoir writer Phillip Vigel. "Ideal facial features and impeccable forms were all the more vivid with the permanent simplicity of her attire." Naryshkina did not wear jewels and at the court balls appeared in simple white dresses. She never wanted to become Alexander's wife, never meddled in politics and never used her position to amass wealth. The emperor practically never hid their relationship and would open balls with a polonaise with Maria. In 1814 their affair, which had lasted for 13 years, came to an end. It is not clear who was the initiator, just as it was unknown who was the father of Naryshkina's five children. But it is said that once when the emperor asked her husband, Chief Master of the Hunt Dmitry Naryshkin, about the health of the children, the latter responded: "About which children, Your Imperial Majesty, are you inquiring? Mine or yours?" 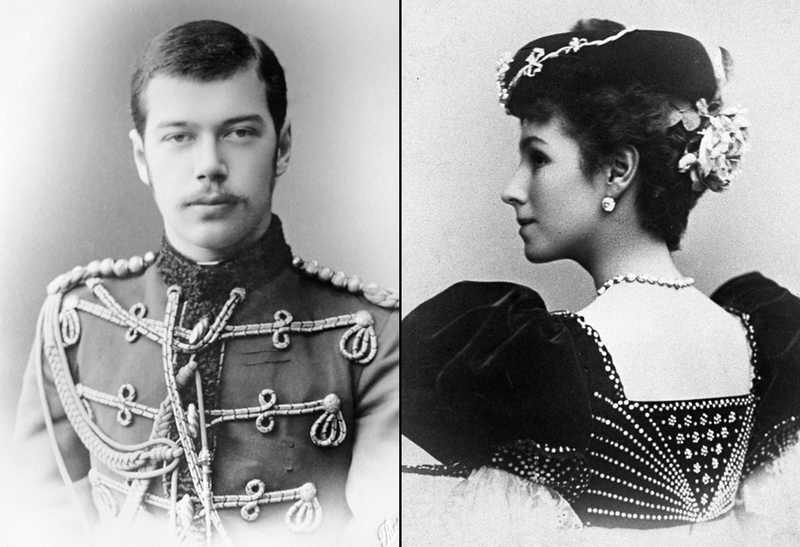 Emperor Alexander II was 28 years older than his mistress. He knew Dolgorukova when she was still a little girl, from his visits to her father's estate. Then he met her in the Summer Garden when she was 18 and fell head over heels in love with her. They began promenading, enjoying secret rendezvous, and in 1878 the emperor arranged for the princess to move into her own private apartments at the Winter Palace. After that they never separated. And yet they wrote 6,000 letters to each other in the 15 years they were together. In 1880 Alexander II's consort died and a month later, having stopped mourning, the emperor led Dolgorukova to the altar. She received the title Princess Yurievskaya. Her three children, whom Alexander officially recognized as his own, received the same surname. This family happiness did not last long: On March 1, 1881 the emperor, who had been wounded in an attack upon him by a terrorist bomber, died at the palace in the arms of his young wife. Having become a widow at the age of 33, Dolgorukova did not remarry, outliving Alexander by 40 years. In the 1959 French film Magnificent Sinner, which tells the story of their romance, Dolgorukova is played by Romy Schneider.